This declassified photo shows Cmdr. 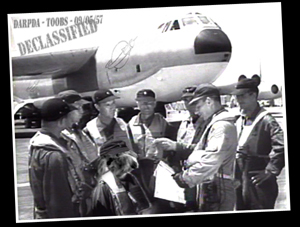 Riley and the other members of the secret STFU project being briefed prior to mission launch. The Synclastic Trans-dimensional Furtherance Undertaking was a special project at the dawn of the space race, seeking to penetrate not just the boundaries of Earth’s atmosphere but to cross the dimensions of space and time itself. The first manned test launch, with Canine Commander Riley at the helm, ended in disaster when the craft exploded on launch in a fiery burst of burning fuel and highly charged plasma. No official cause for the accident has ever been disclosed. No remains of the craft were ever found. The project was quietly shut down and, like the Philedelphia Experiment before it, the files were sealed. Since that fateful day it was believed Cmdr. Riley had perished in the blast; however, with the inception of the internet and the world wide web, reports have surfaced of garbled communications being sent from someone – somewhere – who claims to be Cmdr. Riley. There is good reason to assume he survived the launch and is now travelling in the STFU-1138 inside the internet itself. This web portal has been established as an online home base through which Riley can make his reports on where he is and what he finds In Teh Toobs. Stay tuned. Keep watching the toobs.